This PDF 1.4 document has been generated by Writer / LibreOffice 3.3, and has been sent on pdf-archive.com on 19/02/2014 at 23:18, from IP address 41.250.x.x. The current document download page has been viewed 635 times. File size: 639 KB (4 pages). images which are more adapted to human visual system. technique using nearest-neighbor interpolation method. the image quality is degraded. compared to those obtained by the former one. representations have found a great interest in using this system. applications and are limited in others . complicate the omnidirectional image unwrapping process. converting polar coordinates to Cartesian coordinates. are aligned (Fig. 1). Sensor has the following specifications. The spherical mirror has a radius of 3.5 cm.  The focal distance is variable.  The resolution is 640x480.  The interface is USB 2.0.  The ratio of the video stream is 30 fps.  The color depth is 24 bit. pixels. This process is often called &quot;unwrapping&quot; (Fig. 3). image. (b) a real image. Fig. 3 (a) Original synthetic omnidirectional form (b) unwrapped form. from omnidirectional images to panoramic ones. Fig. 5 Distorted image due to the unwrapping process. this work,we have just reported two cases. omnidirectional camera in this experimentation (Figs. 6 and 9). parameters are used in the first step of the algorithm. Fig. 6 The input omnidirectional image acquired with the catadioptric camera. overcome this discontinuity (Fig.7). It can be seen from (Fig. future, we will extend this work to video unwrapping process. 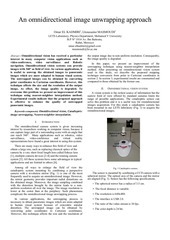 Y. Xiong, K. Turkowski, Creating image based vr using a selfcalibrating fisheye lens, In CVPR97, pages 237--243, 1997. Vision and Camera Networks (OMNIVIS 2005), October, 2005. R. Cutler, Y. Rui, A. Gupta, J. Cadiz, I. Tashev, L. wei He, A. Meeting Capture and Broadcasting System” ACM Multimedia, 2002.
applications,” Ed Springer Verlag, 2001. This file has been shared by a user of PDF Archive. Document ID: 00147595.